Occupation: Would-be conqueror; former despot of the African nation of Umbazi. Powers/Abilities: The Manipulator possessed a "mystic gem" which could brainwash people when a controlled beam of light was shone through it and onto their heads. The stone was powerful enough to hypnotize an entire fleet of warships and every man on them. His cloak was rigged to deliver a powerful electric shock to anyone who tried to touch him, and he had a throne which could dispense streams of toxic "nerve gas". The Manipulator also possessed a high level of scientific skills, which allowed him to outfit the Highwayman with a number of deadly weapons, and he also knew how to fly a fighter jet. Presumably he could have commanded some troops when he ruled the African nation of Umbazi. 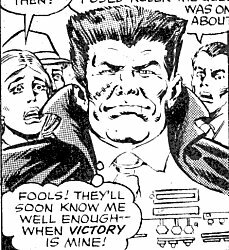 History: (Super Spider-Man and Captain Britain Weekly#231/2 (fb) ) - Basil Crushstone, known as the Manipulator, once ruled the African nation which would one day become known as Umbazi. He ruled with a ruthless and bloody iron fist, working the people to death in the diamond mines. One day a miner was brought to him in a hypnotic stupor -- the miner had uncovered a gemstone which had put him into a trance. Having heard legends of such stones, Crushstone had the gem cut and polished. (SSM&CBW#231/2 (fb) - BTS) - Using his new weapon, the Manipulator controlled his populace even more tightly, keeping them hypnotized and obedient to his every command. Eventually, however, a resistance group managed to launch a revolt which drove him from power. (SSM&CBW#231/2 (fb) ) - Dethroned, he fled to England, where he studied and experimented to improve and amplify the gem's powers. A chance encounter led him to outfit a motorcycle thug with powerful high-tech weapons and he become his new ally--the Highwayman. Thus prepared, he set in motion his plans to restore himself to power. (Captain Britain I#37/1) - As crowds watched the British Royal Family pass by in a procession, a mysterious figure watched with contempt. He thought of the people cheering as sheep, but acknowledged to himself that his unspoken masterplan depended on that very fact. He turned and strode away purposefully, telling himself that when the time came to strike, not even God would be able to protect the Queen from "the Power of the Manipulator !!" (Captain Britain I#38/1) - The Manipulator continued to wander through the cheering crowds, angry and impatient that the Highwayman was late for their appointment. He told himself that if he still held power in Africa, he would have executed the Highwayman for his insolence (being ten minutes late), and decided to return to his lab to wait for the mercenary there. (Captain Britain I#38/1 - BTS) . His hireling eventually turned up, complete with the unconscious form of hero Captain Britain. (Captain Britain I#38/1) - The Manipulator placed the hero in a restraining chair, and then used his mystic gem to brainwash Captain Britain into attacking the Queen during a public rally. (Captain Britain I#39/1) - As Captain Britain hurtled towards the podium Queen Elizabeth was on, the Manipulator lurked nearby and watched as his plan was carried out. As he had planned, the Highwayman intervened and saved the British monarch from the mind-controlled superhero. As the hero was led off in chains, the Manipulator gloated that soon he would control the Queen herself. As per the Manipulator's instructions, the next day the Highwayman managed to switch one of the Queen's favorite rings for an imitation containing the Manipulator's stone. When the Queen reviewed the Royal Navy a few hours later, the Manipulator activated the gemstone by remote control, taking over the Queen and then the entire British fleet. Following the Manipulator's order, the Queen commanded the fleet to set sail for Africa, where they would return the Manipulator to rule in Umbazi. (SSM&CBW#231/2) - The Manipulator watched from the quayside as the Queen informed the fleet of her intention to sail to Africa and conquer Umbazi for him. In front of astonished crowds of onlookers, he walked up the gangway on to the aircraft carrier Ark Royal. On board he addressed the crew, then spotted the fast approaching form of Captain Britain flying towards him. He ordered the gunners to shoot the superhero out of the air, which they appeared to do. A little later the Highwayman moved from the Royal Yacht to the Ark Royal and joined his boss, capturing Chief Inspector Dai Thomas, who had smuggled himself on board, en route. The Manipulator explained to his new captive about his fall from power in Africa, and his plans to regain his throne. Then he threatened to drop the hog-tied police officer into the English Channel to drown. Captain Britain, who had survived the earlier barrage and snuck on board too, burst into the cabin, and swiftly knocked down the Highwayman. Before he could attack the Manipulator however, the villain activated twin jets of poison gas which shot from the arms of his throne. As the hero and the cop began to choke to death, the two villains left them to die. (SSM&CBW#232/2) - The Manipulator stood on the deck of the Ark Royal gloating to his henchman that he would soon be back in power in Umbazi, and that not even Captain Britain could stop him now. Then there was an explosion from below decks, which he believed came from the vicinity of his hypnotic equipment. He stated that if his machinery had been wrecked then it would be the end of his plan to reconquer Umbazi. Even as he said this, Captain Britain (with Dai Thomas in tow) flew out of the new hole in the deck. The hero confronted the two villains, and Highwayman offered to his boss that he would fight Captain Britain again. The Manipulator told him there was no need -- not when the British Navy was available to do their bidding. So saying, he set several seamen on Captain Britain, ordering them to bash the hero to a pulp. 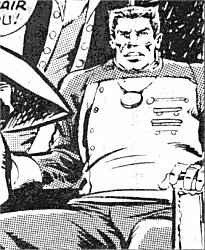 Dai Thomas broke the Manipulator's hypnotic hold on the men by setting off some signal flares, and then Captain Britain dealt with the Highwayman. 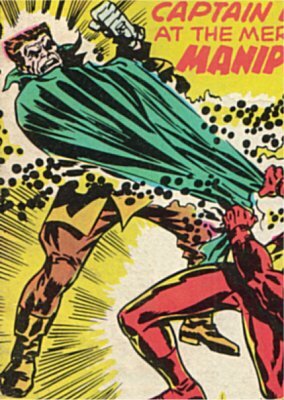 The hero then turned his attention to the Manipulator, but when he grabbed the despot's cloak, Captain Britain was laid low by a powerful electrical charge running through the garment. As the hero fell to the ground, stunned, the Manipulator strode over to a fighter jet. Climbing into the cockpit, he vowed to return more powerful than before. Then he took off, the plane launching off the end of the Ark Royal...and crashing almost immediately into the sea, as Dai Thomas had ordered the seamen to empty all the plane's fuel tanks, under instructions from Captain Britain to block all means of escape. Basil Crushstone, the Manipulator, was lost at sea, believed to have either died in the crash or drowned shortly afterwards. Comments: Created by Len Wein, Ron Wilson and P.Marcos. Could the Manipulator's "mystic gem" had any connection to the Lifestone Tree?